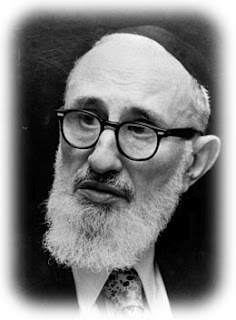 In honor of the upcoming yahrzeit of the Rav's passing (on Hol HaMoed Pesach, the 18th of Nisan, in 1993) and of the anniversary of his recent birthday (Feb. 27, 1903) we offer to our readers a link to a scan of my teacher Rabbi Joseph B. Soloveitchik's doctoral dissertation in the field of philosophy written at the University of Berlin, 1930. ...It is reported that the Rav would have liked to write his dissertation on Maimonides and Plato, but since no experts in these subjects were available in Berlin, he chose a field of pure philosophy, tempered with mathematics. His chosen field was the philosophy of Hermann Cohen, the famous Jewish philosopher of the so-called neo-Kantian school of the University of Marburg. For this study his main teacher was Professor Heinrich Maier, the greatest expert in Cohen's philosophy at the time. Maier's curriculum vitae shows a great variety of philosophical subjects, which he had mastered before specializing in Cohen's philosophy. As a result, the Rav's dissertation of 110 pages deals largely with Professor Heinrich Maier's own interpretations of Cohen, rather than with Cohen himself. Its title is as esoteric as its contents: "Das reine Denken and die Seinskonstituierung bei Hermann Cohen." ("Pure Thought as the Constitution of Being in Hermann Cohen's Philosophy" -- my free translation). I, Josef Solowiejczyk, was born February 27, 1903, in Pruzna, Poland. In 1922 I graduated from liberal arts `Gymnasium' in Dubno. Thereafter I entered in 1924 the Free Polish University in Warsaw where I spent three terms, studying political science. In 1926 I came to Berlin and entered the Friedrich Wilhelm University. I passed the examination for supplementary subjects at the German Institute for Studies by Foreigners and was then given full matriculation at the University. I took up studies in philosophy, economics and Hebrew subjects. I wish to express my sincere and hearty thanks to my highly honored teachers, 'Geheimrat,' Professor Dr. Heinrich Maier and Professor Dr. Max Dessoir. Furthermore, my thanks go to Professor Dr. Eugen Mittwoch and Professor Dr. Ludwig Bernhard. the archetypal teachings of the Rav -- "God's Favorite Prayers"
Great. I have a more readable copy which looks like it was scanned directly from the University of Berlin document. Does "orientalischen" really mean "Hebrew"? Thanks JG I posted it. Has this dissertation ever been translated to English? If so, could someone post a link?